The sneaky @evleaks Twitter account is at it again today, posting a leaked press render for Sprint’s upcoming Galaxy Mega 6.3 smartphone from Samsung. Yep, that thing is a beast of a phablet. Sporting a 6.3″ HD display, the Mega 6.3 features a Snapdragon 400 processor, Android 4.2.2, an 8MP back-facing camera, an Adreno 305 GPU, and access to Sprint’s 4G LTE network where you can find it. It isn’t a top tier smartphone, but for anyone looking to have a massive phone with Samsung’s latest proprietary software, then here you go. No official word yet on pricing or availability, but rest assured that once Sprint makes it official, we will have the info for you. 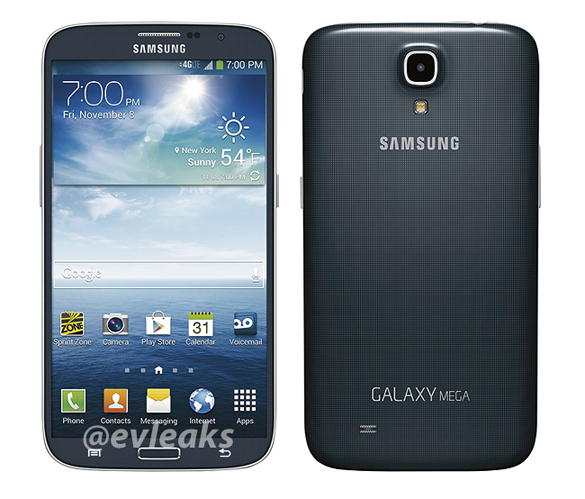 If the Mega came to Verizon, would you be interested?